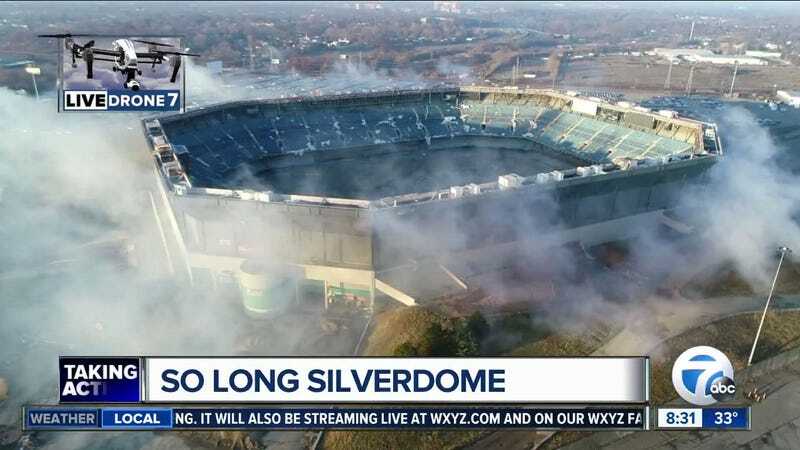 The Pontiac Silverdome wanted to stick around a little longer. The Detroit-area stadium, which hosted a number of major sporting events in the 1980s and 1990s, has been in a state of disrepair pretty much since the Lions moved to a new stadium in 2002. The building was scheduled to be imploded this morning in order to pave way for redevelopment in the area. That didn’t happen. An executive from the demolition company, Adamo Group, told the Detroit Free Press wiring failed on the demolition attempt. The structure could still fall, but they’re not sure when. Allie Gross, a Free Press reporter, tweeted that she was standing next to Adamo employees when the implosion was attempted. Lions fans in attendance were reportedly shocked—usually it was well into the afternoon before they left the Pontiac Silverdome parking lot disappointed. Who Wants A Pontiac Silverdome Urinal Autographed By Barry Sanders?